Australia’s Grace Kim has shot an ANNIKA Invitational record with a stunning round of 10-under par, 62 to take the outright lead at the ANNIKA Invitational Australasia. It’s turning out to be a special week for Kim who enjoyed her 18th birthday at the opening ceremony to now shoot an ANNIKA record from all her worldwide events and personal best at the Royal Wellington Golf Club. After making another clutch birdie on the final hole, her eighth of the round, she was greeted by none-other than Annika Sorenstam herself with a hung of congratulations. Kim also made an eagle on the fourth hole to hold a one-shot lead entering the final round. “I started off well by having a birdie, birdie start and then just missed my birdie before making an eagle which was pretty cool. I was bogey free, so no mistakes which was good and I’m happy,” said Kim. The now 18-year-old and world number 85 was ecstatic to beat her previous best of seven-under and with ease and even got a hug to from the world’s greatest to show for it. Overnight leader, Yuka Saso remains a huge threat in what has almost become a shootout between the pair. Trailing by one shot, the next best behind Saso is Australia’s Doey Choi who is a further four shots behind. 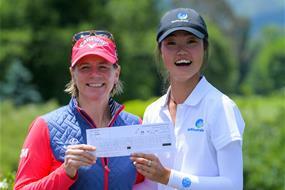 In fourth place flying the Kiwi flag is the New Zealand Amateur Champion, Vivian Lu who continues to impress this week. After an opening round of 71, she went one better today to card a solid round of 70 and will enjoy the experience of playing in the penultimate group. The final group will tee off at 9:20am tomorrow as local golf fans get the chance to witness two of the future greats in our own backyard.